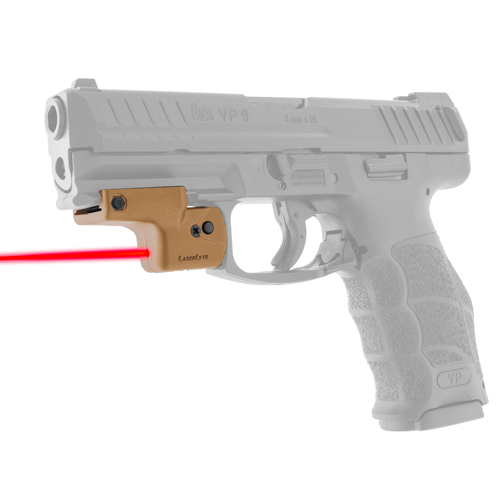 LaserLyte, innovators in firearms laser technologies, is proudly introducing a tan version of the famous Lyte Ryder Universal Pistol Laser. Until now, black was the only color choice for the most custom fitting universal rail mount laser. This natural Tan tone is not the result of any exterior paint or coatings-before being molded, the molten glass-filled nylon is actually dyed tan so the entire housing is made from a solid color that will never flake or chip off. In seconds, LaserLyte's Lyte Ryder adds a sweet two-tone touch to any pistol with a Picatinny rail. A single mounting screw secures the laser housing in place and you're good to go. Designed with simplicity in mind, each Lyte Ryder package includes a Class IIIA Master Module laser and two laser housings that are perfectly tailored to fit most rail-equipped subcompact, compact and full-size handguns. Simplicity continues with ambidextrous activation buttons, allowing left- or right-handed shooters to easily operate the laser in constant-on or pulse modes. Snag-free contoured lines support quick-draw and re-holstering, and its slimline form minimizes Lyte Ryder's printing in concealed carry situations, yet remains simple to activate at a moment's notice. Batteries can also be changed without removing the laser from the pistol, and a 6-minute auto-off function conserves battery power. Exterior windage and elevation adjustments also enable precise aiming and zeroing at any preferred distance. Everyone knows black is the new tan! Join the cool operators on the block and slide a tan Lyte Ryder on your pistol rail for a slick look with premium performance.